As a huge fan of psychological thrillers, it bums me out that there aren’t a lot of them in YA. So whenever I DO find one, I freak out and get grabby hands! 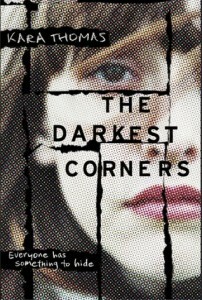 The Darkest Corners was one of my most anticipated books of 2016 and, though I enjoyed it, I wanted MORE from it. The ending totally blew me away, but I felt really disconnected from the characters and the plot was intriguing, but not very suspenseful. Tessa and Callie are both main characters, but the story was told from Tessa’s point of view. In the beginning, I wasn’t a fan of Tessa. But as the story went on, I appreciated how driven to discover the truth she was. She found herself in some crazy (and scary) situations, especially near the end. And those moments in the end were crazy and intense. Callie was incredibly self-destructive in the beginning. I didn’t necessarily connect with her, but I felt bad for her and the things she went through. She didn’t have it easy and she dealt with those memories and emotions in the only way she knew how. Like Tessa, she found herself in some crazy and scary situations – again, especially near the end. I definitely feel like she had a lot of character growth from beginning to end. I would have loved seeing some of the story from her point of view. I think it would have made things more interesting. The last 45 pages were a whirlwind of action and revelations. I was really hoping for more suspenseful moments, but there were still a lot of intriguing moments that had me thinking and guessing, coming up with wild theories, dying to know how things would end. I think I put this book up on a REALLY high pedestal because of how excited I was for it. And maybe that was part of why I feel a bit let down by it. I was expecting so much – hoping for so much. Maybe I set the bar TOO high with this one. Maybe if I had gone in with lower expectations, I would have enjoyed it more. Who knows? It still had some great moments, but I wanted MORE great moments. Overall, this was an intriguing read. I wish I had been able to connect with the characters more and I wish there had been more suspenseful moments, but the last 45 pages made up for a lot of that with how insane and intense they were! I loved seeing all the pieces of the puzzle fall into place and I loved the explanations and resolutions. I can’t wait to see what Kara Thomas writes next!